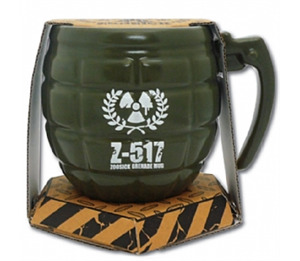 The very popular grenade mug is now back in stock, so get them while they last. Theis novelty mug is perfect for the gadget lover and as an office mug it's brilliant because it's unlikely that anyone else will have anything even remotely similar. England Through To The Quarter Finals! Congratulations England for making it through to the Quarter Finals of the Euro's 2012, and to celebrate this brilliant achievement we are doing some awesome offers! Also with any order on our site will be entered into our England Final Competition, Where if England win the Euro's 2012 you will received 20.12% of your next order, if they take second you will get 10% of your next order or if they steal third place we will give you a 5% discount of your next over and a free England Fluffy Balls with your next order. If they do take third or better we will send you a unique code in an e-mail to use in the check out. And if that wasn't enough if England win against Italy on 24th June anyone who made an order from today to one hour before kick-off will get a 15% discount code for off there next order. Are you going to one of the many British Festivals this year? Well you're going to need the wicked wedge! We've got some new cool beer bongs in stock ready for everyone's summer holiday! We got the awsome balcony beer bong which is 18ft long :O how cool is that? We also got the Xtreme beer bong which is 6ft long (looks small compared to the balcony bong), got the green ultimate beer bong now in stock and more of the LMFAO beer bong's and of course for the Euro's the England special Beer bong, White and Red with the England flag on it. We are also hoping to be getting the Welsh Beer Bong in stock :D So to make your party even more crazy look no further then Gadget Inspector. We have the brand new Marvel Avengers "Hero Team Chase" Carrera Go!!! Set in stock now. Race with your favorite super hero's and you speed around this cool track with either Iron Man or Caption American, you can get your Marvel Avengers Go!!! Set now for only £54.99. We also have other really cool Go!!! Set in stock including the brand new Spider-Man "Manhattan Showdown" with awesome spider-man and lizard car.